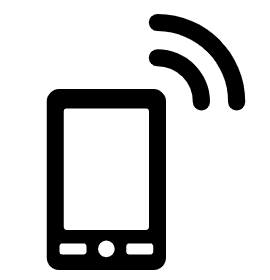 Android Phone Tethering - Internet sharing without the carriers approval - No root required! Get the PdaNet+ app on your Android phone. 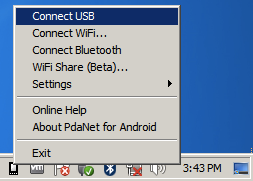 Install PdaNet+ on a Windows PC. Now you have an internet connection on your Windows OS regardless if the carrier allows to tether your Internet or not. The best part is that you don't need to root your phone! Q: What if I have no Internet on my PC but want to get the .exe file? A: Use your phone to download the file then transfer it to your Windows PC via the USB cable. If you get no connectivity make sure "USB Debugging" is enabled on your phone. It is inside 'developer mode' in Android. Add your PC as a trusted device once connected. 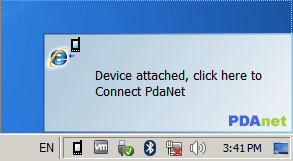 PdaNet+ is a shareware app. It does nag you every once in a while to purchase the full app for 8 EUR. 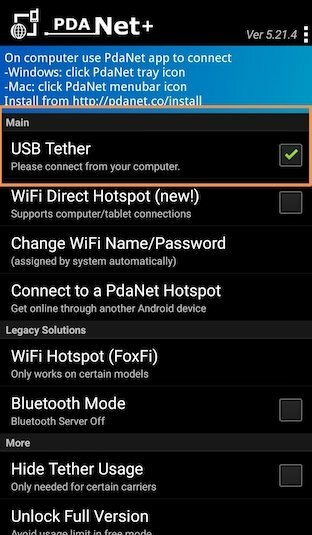 Click "Cancel" on Android and click again the "USB Tether" checkbox. I did get it to work inside of a VM. Of course the host OS has no Internet, but the guest VM has Internet. In 2013 it was the first time it happened to me where I happily got a SIM card with Internet from Rogers in Toronto, Canada only to find out that I can't share my Internet on my laptop. It was not a disaster. The local data center I worked in also had free WiFi. The Hotel where I stayed at had free WiFi too.